These cute as a button mod style shoes are the real deal. 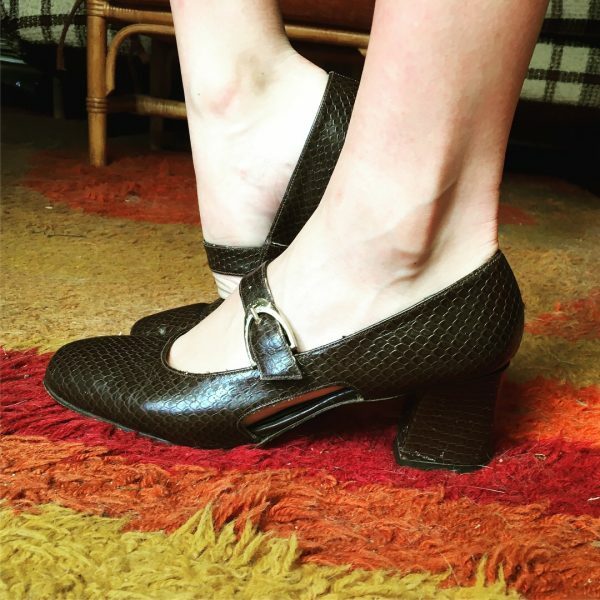 They feature a snake skin finish in chocolate brown, block heel, square toe & feature buckle. They are in good condition for shoes of this age (late 60’s / early ’70’s). They are not sized, however they have fit on a womans size AU 5 foot. Yes they are tiny, but if they weren’t tiny I’d be keeping them! Perfect to team with a 60’s style short shift dress & snake skin brown bag.